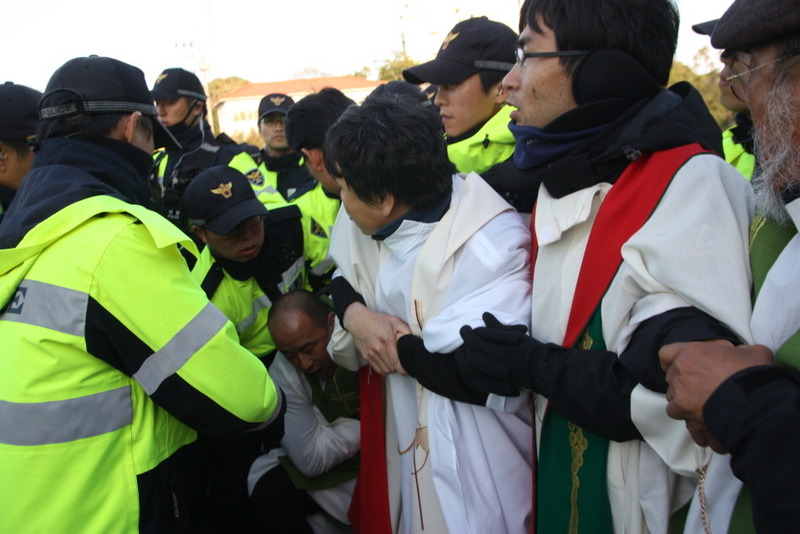 Photo by Jang Hyun-Woo, Catholic priests united facing the navy and police violence and insult in front of construction gate, Nov. 12, 2012. For many more resourceful photos on the day by Jang Hyun-Woo, see here. While the civil disobedience movement declared by Prof. Shin Yong-In, in front of the construction site in Gangjoeng started on Nov. 12, Catholic priests made voice on the same day as well. Since Fr. Lee Young-Chan(Jesuit) was arrested and imprisoned on Oct. 24, the Catholic priests have been holding a special mass beside their daily 11 am mass in front of construction site, every 4pm, Monday. At 4 pm, Nov. 12, Catholic priests, clergy men and women who belong to the Catholic Solidarity for the Realization of Jeju, Peace Island, visited the village before the evening mass held by Bishop Kang U-Il in the Jeju City on the day. 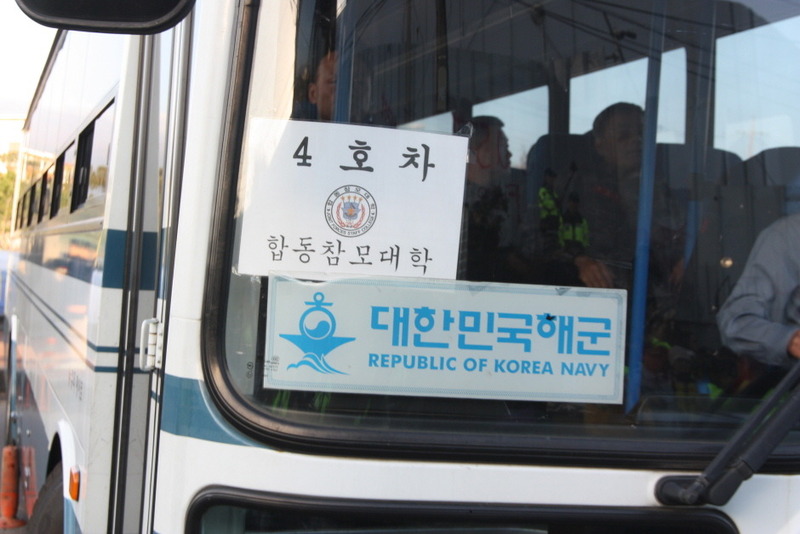 It was about 30 minutes later that four buses marked with ‘Korea National Defense University: KNDU’ and ‘ROK navy’ were to visit the Jeju naval base project building complex. When their entry became impossible because of the mass, police were mobilized and the police roughed out and moved away priests from the site, saying that the priests were doing of ‘obstructing business.’ Priests were released only after the buses passed into the building complex despite people’s protests. 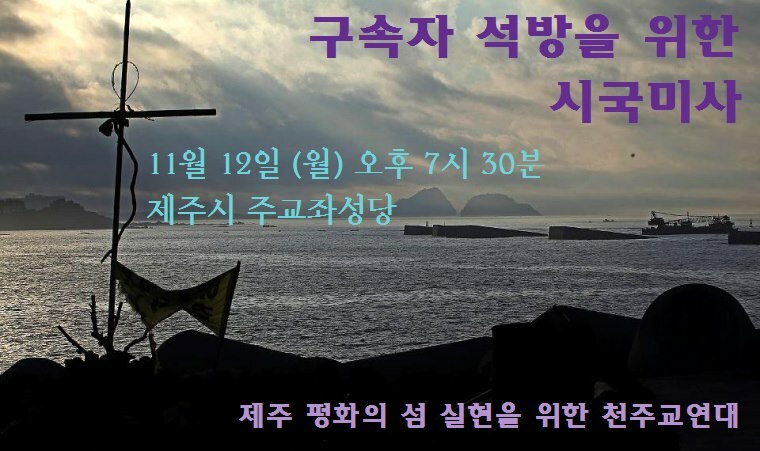 Catholic Solidarity for the Peace island, Jeju, starts signature campaign until Dec. 2 (1st week of Advent) demanding ‘the release of Jesuit priest Lee Young-chan S.J and four other prisoners of conscience’ and ‘the overall re-examination of Jeju naval base construction’. . . 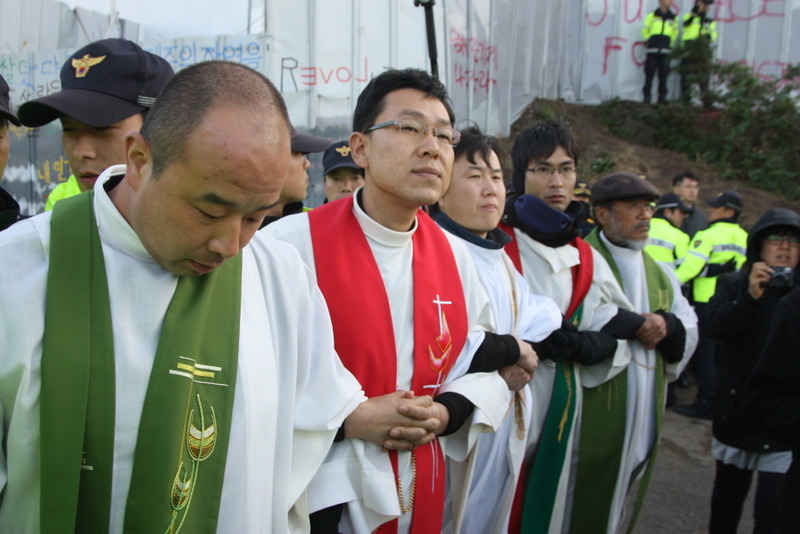 In this photo, Catholic priests are blocking the cement mixing trucks after the mass of November 12 at the gate of Jeju naval base construction site. “Peace is not merely having no war or guaranteeing balance between the hostile powers. Peace is a serenity of order. Peace is the result of justice and fruit of love” (Clause No. 2304, Catholic creed, read by Bishop Kang U-Il). 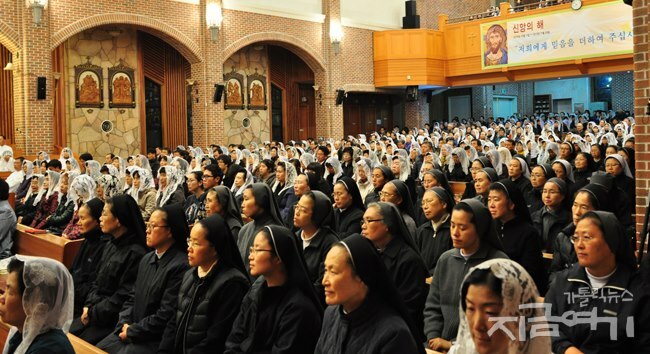 There was a ‘Nation Situational Mass to Release the Prisoners by the Naval Base project,’ in the Central Catholic Church, Jeju City at 7:30 pm, Nov. 12. 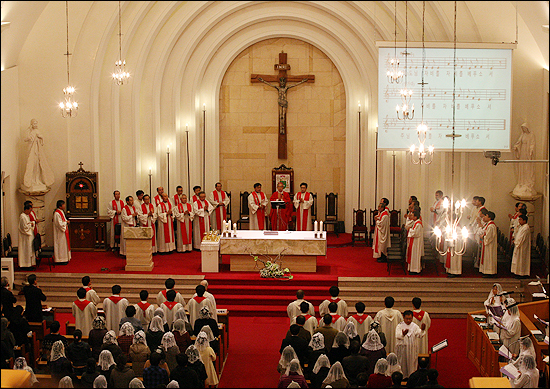 The mass was sponsored by the 15 dioceses of the Justice and Peace Committee of the Catholic Bishops’ Conference of Korea, Catholic Human Rights Committee, Catholic Solidarity for the Realization of Peace Island, Jeju. More than 20 Catholic priests and Catholic nuns have been arrested in their protests against the naval base project in the Gangjeong village. In March, Fr. Kim Jung-Wook was first imprisoned (released after about 40 days) as a Catholic priest and on Oct. 24, Fr. Lee Young-Chan was imprisoned. Both are the Jesuits. Nov. 12 poster by the Jesuits Korea (Caption by Regina Pyon): At 7.30 p.m. on November 12, Catholic mass is held officiated by Bishop Peter Kang U-il at Jeju cathedral for the release of Jesuit priest, Lee Young-Chan S.J, and imprisoned peace activists. It was organized by the Catholic Solidarity for Peace Island Jeju, that 15 national justice and peace commissions and representatives of lay and religious committees are participating. 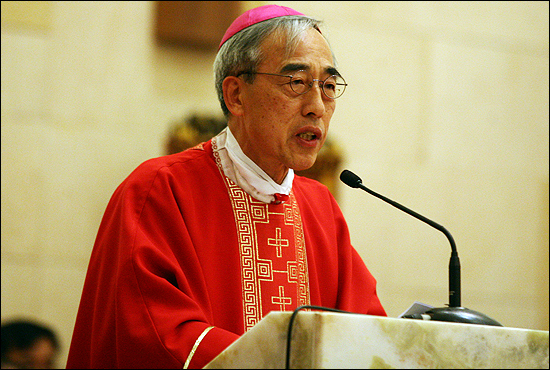 Bishop Peter Kang is also chairperson of Catholic Bishops’ Conference of Korea. Full text of Bishop Peter Kang’s homily “There is no just war.” can be read here.